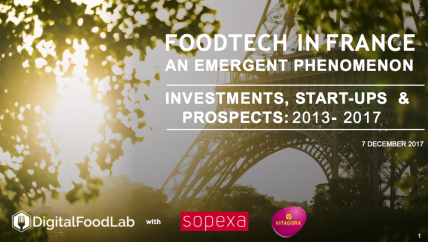 This report is based on the study of the 400 FoodTech start-ups founded in France since 2013. They have raised €317 million in funding since 2013 with a threefold increase in the amount invested between 2015 and 2016. These last two years were highlighted by the first funding rounds of over €20 million. French FoodTech accounted for 1.13% of worldwide investment from 2014 to 2016. 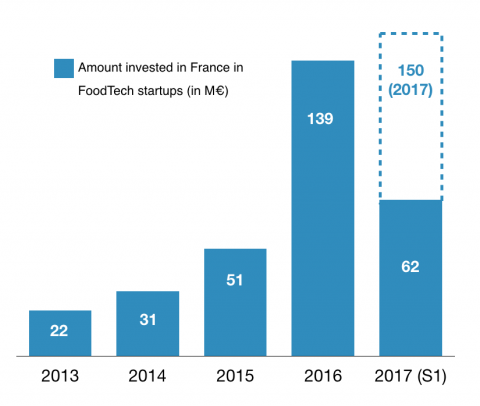 For France, which has a reputation as the country of gastronomy and has number of major food manufacturers and retail chains, FoodTech is a golden opportunity that remains to be capitalised on. This report also looks at the geographical distribution of start-ups. They are unevenly distributed across the country with 63% of operating start-ups, 66% of funding rounds and 80% of the funding raised concentrated in the Île-de-France (Paris) region. However, a second hub of activity is developing around Lyon and the sector is emerging in several other regions. Looking closely at individual FoodTech areas, we can see that meal and grocery delivery services dominate the ecosystem (with 40% of the investments).